This is an open invitation, there is no expiry date for it. There are no strings attached. That is to say that a filthy sinner and a saint are equally welcome to come to the Lord when they find themselves in a position of weariness. God is no respecter of persons. He looks at the heart, where man look at means and outward appearance to judge a person. Our nature is to keep up appearances. I believe that this is one of the reasons we continue to have such high rates of suicide among young men. They do not know where to go when they are weary and heavy ladened. Life if very difficult! There are points where these people got to where they saw no better way than to give it all up, and end their own lives. If you have been close to that, you are not alone. I want to let you know that it gets better. Seasons change, what you face today will pass. “He seemed so happy.” Is what you will hear many loved ones say of someone that has taken their own life. There are many people who are dying inside, but carrying a perpetually painted smile on their faces. This is the same thing that you will often encounter in ministry. We encourage praying for leaders because they too are often weary. They have the burden of each and every member of the ministry to carry. They also have their own family matters. These people are just as human as any one of us. Where we can shut the world out, they cannot. It is their role to make sure every sheep in the flock is cared for. Levels of depression are high among clergymen because they are weary and heavy ladened. Perhaps I make it sound to easier than you may think it is. Yet we know his word to be truth, as evidenced in John 17:17. Christian history is filled with men and women who had nowhere else to find peace but in Christ. Think of King David for a moment. For the most part when we discuss him, we think of Samuel coming to anoint him or when he toppled Goliath. These glorious moments are what we love to talk about. This negates the fact that his times were often filled with turmoil. This is a man who spent years on the run having been anointed king of Israel. 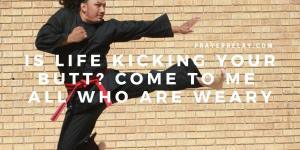 The Psalms tell us tales of his raw emotion, when his enemies were in pursuit of him. His testimony is strengthened by each and every challenge that he faced. He was not a wealthy man at this time. David was a mere dissident at the mercy of those in power. Yet his God preserved his life! What of Joseph? A little boy whose dreams from God had landed him in a pit! He was at the mercy of traders, rulers and jail wardens. It is in these moments that he was in desperate need of rest. When he had no one to turn to, he found rest in Christ. 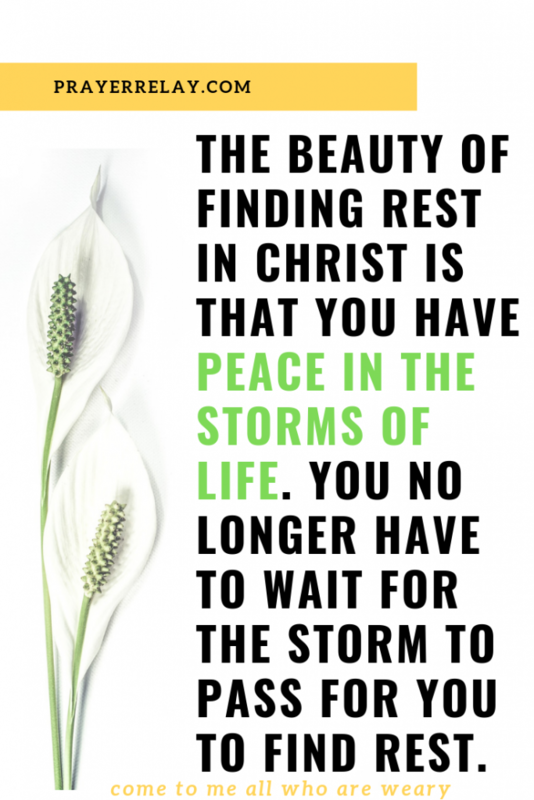 The beauty of finding rest in Christ is that you have peace in the storms of life. You no longer have to wait for the storm to pass for you to find rest. 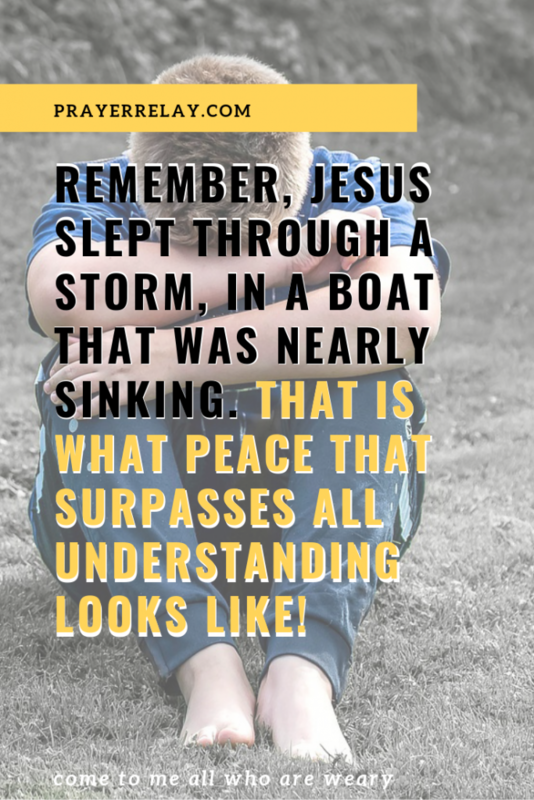 Remember, Jesus slept through a storm, in a boat that was nearly sinking. That is what peace that surpasses all understanding looks like! We could go on and on with the examples. 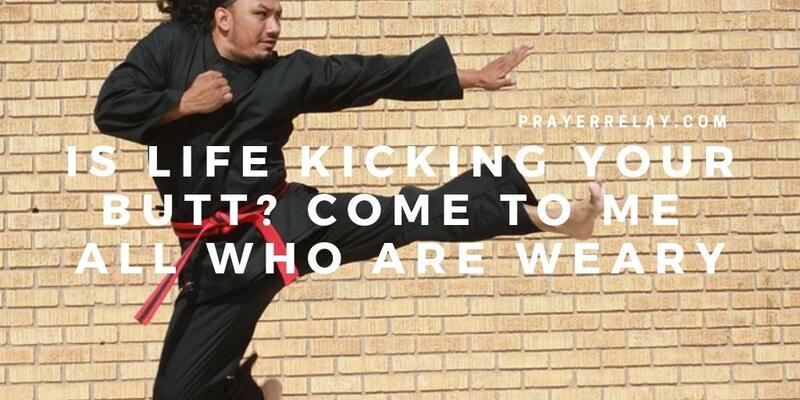 Stronger men and women in tougher times have known to turn to Christ in times of need. Our sinful nature often hinders us from freely connecting with Christ. Right from the beginning, we know that Adam and Eve went to hide when they had gone against the will of God. Sin reveals our nakedness, which is covered by the blood of Christ. When we are sinful, we no longer see the value of the blood of Christ. In a way, we go into a self-imposed exile from God. Falling short of the glory of God should become a motivator for us to seek God with more intent. We desperately need to be guided back onto the right path. 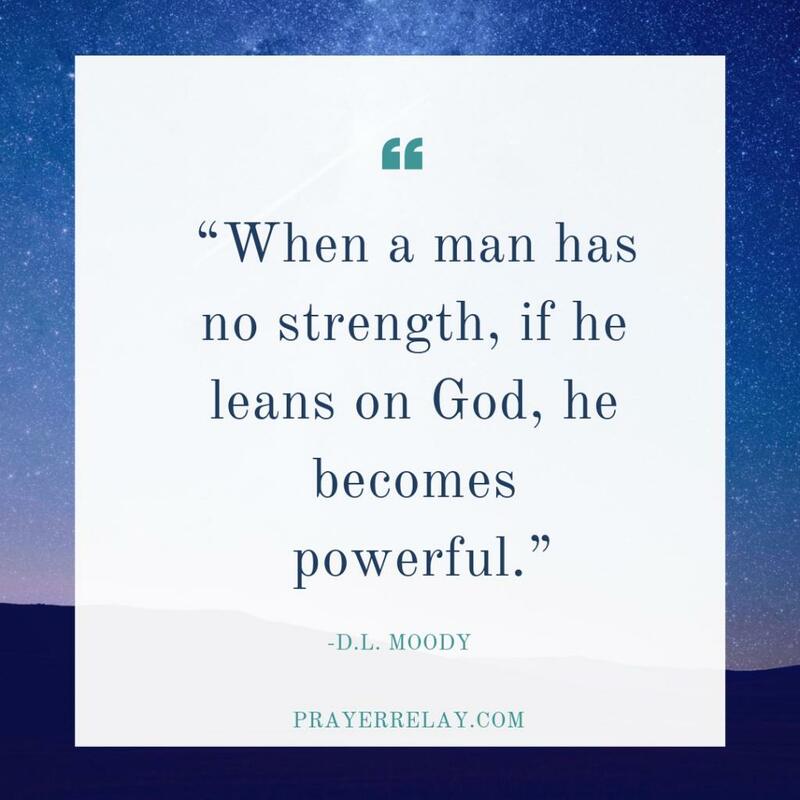 This is where that age old statement rings true, “The spirit is willing but the flesh is weak.” It is in coming to Christ that we are rejuvenated, and re-strengthed. Self exile forces us to walk in our own strength, to become independent of the omnipotent God. The only way to get rest is to remain in constant communion with God. The apostle Paul encourages us to pray without ceasing. 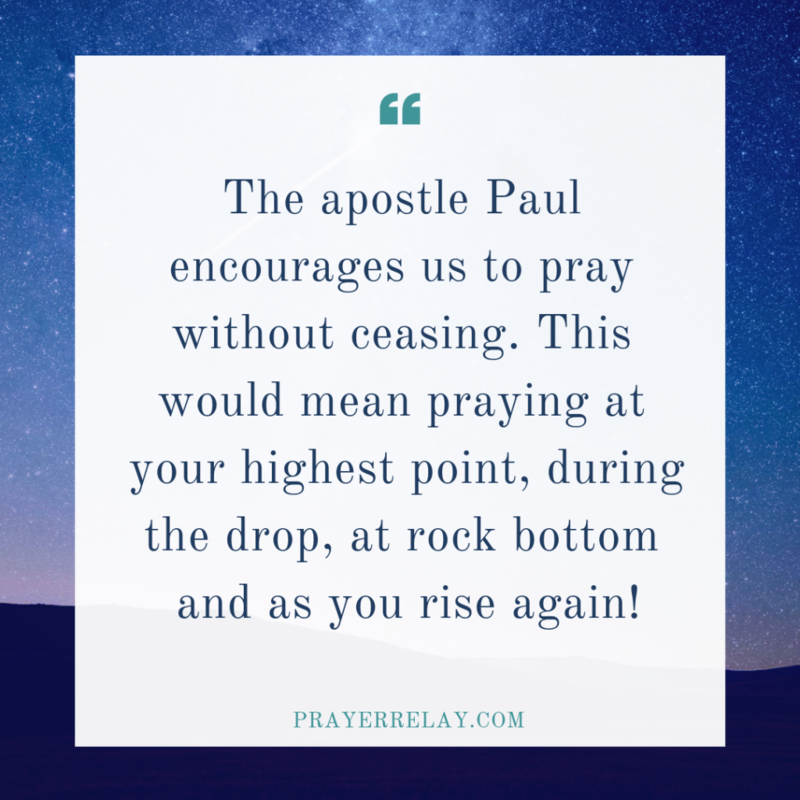 This would mean praying at your highest point, during the drop, at rock bottom and as you rise again! Pray through temptation. Tell God everything about everything. Lay your weaknesses bare before him at each and every turn. We are all different, some find it easy to be prayerful in times of need. Others shy away from God in times of need, perhaps even somewhat blaming it on him. The greatest power of prayer is derived from consistency. All things may have seasons, but prayer is never out of season. Your relationship with God needs to be constantly nourished, for there are too many things in this world that are vying for your attention. God forbid that they would take God’s place in your heart. Pray when it is difficult, and you have hit rock bottom. For he is a God of the downtrodden. His resumè is filled with men and women who were lifted from dust and placed on mountain top! Why would he not do the same for you. Do not shy away from being in need. If you are weary and heavy ladened, he invites you to come to him. Accepting an invitation from God doesn’t make you a burden, he delights in helping you. 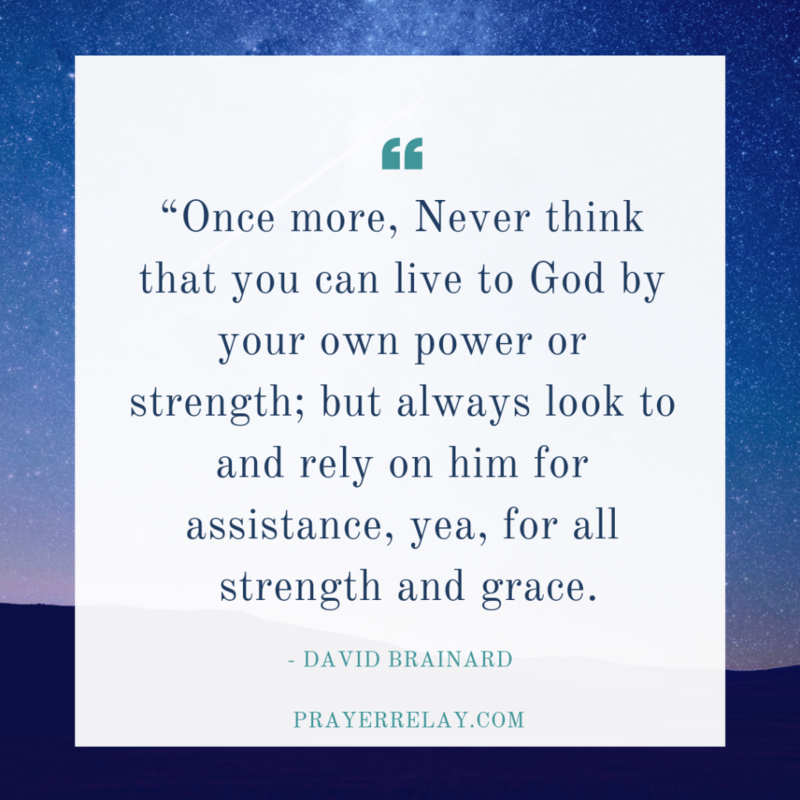 More importantly, never forget that you could never exhaust his grace. Whatever the issue may be. Whatever the burden weighing you down, God’s grace is sufficient. His shoulders are broad enough to take it off yours. Do not be afraid to be vulnerable. Thank you for reading this. We love hearing from you. Let us know your thoughts on this subject, and share your testimonies of times you have had to run to the Lord because you were weary.